Inspection trip – Corvera Golf development Feburary 2009! Hi everybody, welcome to the latest update on Corvera Golf and Country Club, we hope you are continuing to enjoy this free information web site on Spain’s soon to be newest luxury golf resort! We have more great news, and up to date photos of Corvera – however a small apology – it was a little hazardous on the resort this week! There were about 600 workers, dozens of trucks, lorries, diggers, etc. everywhere, all good news, however it has prevented us from getting all the photos we wanted to get. We have also had a number of requests for photos and we really have done our best, but limited photos this month, so many apologies if we have missed your property or your particular area, but we will do better next month we promise! We are sure that you will enjoy them, we have managed to get photos of the North island which is very close to completion and we have some exciting news about phase 3. Also the properties up near the location for the hotel (which will be built) are completed, and look absolutely sensational. You will see from some of the photos that they are now laying the tarmac in some areas. Yet again hundreds of additional trees are being planted around the resort and on the golf course. Also the boundary fence is being erected all over the resort, yes we can actually call it a resort now, it has progressed from a mere building site and it is all really taking shape! Regarding phase 3, we have been reliably informed that the licences for phase 3 will be issued very soon and work should commence in the next couple of months. Completion date for phase 3 is approximately June/July 2010. This might not suit some people, however all the infrastructure for phase 3 is in place, all roads, pavement, paths and street lighting, and by the time your property is ready on phase 3, you will have all amenities, a fantastic championship golf course, a PGA golf academy, an international airport just around the corner, and a golf course and resort with a growing reputation! Not just that! The views from phase 3 will be breath taking, simply superb, no other words for it, also from this location looking back to the sales office in the distance, you really do start to get a sense of the sheer vastness of Corvera Golf and Country Club, owners up here are in for a real treat, well worth the wait. Now you all know that we are huge fans of Corvera Golf and Country Club, and as such we may appear a little biased, well we feel when you all see and experience what we experience every time we go there, you will feel exactly the same, Corvera is “head and shoulders” better than any other resort in the region, maybe Spain, yes it is fair to say “we love it”! We would like to thank the staff at Corvera for allowing these visits and for providing as much help and assistance as they do, as well as doing their best to answer our questions which we ask on your behalf, it really is much appreciated. It was reported in the local press that Jose Maria Olazabal has actually played the golf course, he has had a round of golf with some of the directors at Corvera, now we know the course is not ready, but they completed the 18 hole course testing the hazards and looking to add additional features, the word is that Jose Maria was very pleased with the progress of the golf course. We have said it before, but the space and lack of build density really hits you, even where it looks dense from the sales office, when you actually get in amongst it, there is just so much space, the “Laurel” style apartments look great and some have fantastic views, those without golf course views (not too many) all overlook fabulous pools and wide open communal gardens, or look towards the mountains, very nice indeed. The photos speak for themselves, you do not want us to go on and on, we are obviously aware of everybody’s favourite “moan forum” and we are also aware of everybody’s concerns which we are understand are very valid and we really do sympathise, we try our best to brighten up your day with as positive news as possible, there really is nothing negative I can or want to say about Corvera, we can not blame the developer for the economy or the recession, yes there are delays and yes mortgages are harder to get, no question about it, but as far as we can see, Corvera Golf and Country Club is going to be fantastic and we feel despite the considerable delays, Calidona are going to deliver one fantastic resort. The town of Corvera is growing as we all expected with new properties being built, some new shops, a couple of extra bars, and we have already tried out two brand new typically Spanish tapas restaurants, very nice indeed, most importantly very inexpensive! Finally, with a lot of owners at Corvera due to “complete” their purchase in the near future, we are getting contacted a lot about property management, mortgages, furniture requirements, rentals, etc. Our main sponsors are Calida International Properties and they will be very happy to answer all of your questions, and indeed help with any aspect of the completion process for your property at Corvera Golf and Country Club, please contact them at info@calidainternationalproperties.com or go to their web site at www.calidainternationalproperties.co.uk or continue to write in to us and we will pass on your enquiry. We hope you enjoy this latest instalment, good luck everybody and we will be back in March, keep the faith there is a lot to be excited about!! 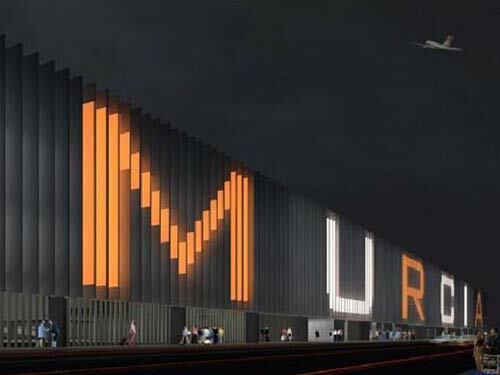 More great news about Murcia Airport! The construction work to build the new international airport at Corvera is still underway despite the general economic crisis that Spain is suffering, and in particular the financial problems the airport’s principle shareholder – the construction company, Sacyr Vallehermoso seem to be experiencing. None of this will delay the opening of the airport! This is what the President of the Region of Murcia, Ramon Luis Valcarcel and the Minister for Public Works Jose Ballesta and the President of Sacyr, Luis Rivero stated during a visit to the airport construction site in Corvera earlier this week. The President of Sacyr has announced that it could possibly be putting on the market between 10 and 15% of it’s shares in the airport but this does not have any relation whatsoever to the company’s financial situation after news that a deal with Repsol has fallen through to a Russian company. This deal would allegedly generate enough funds to cover the company’s loses in the construction sector. After just six short months, since construction began on the 24th of July on the 3,000 hector plot which will soon be the new international airport, the outlining shapes of the new passenger terminal and control towers can already be seen. The rough silhouette of the 3 km runway is also now just beginning to be seen. President Valcarcel added, “This is not like the Tajo-Segura water project; the construction work on this airport has a deadline date which must be met.” If this project evolves in the way that President Valcarcel believes it will then the construction work should be completed by August 2010, however this will not mean that the airport will be ready and open to the public as after the construction work has finished there will be a time period of several months where tests will have to take place before the final permissions are given to the project. During the inspection to the site, Minister of Public Works, Jose Ballesta commented that once the airport is open it will be capable of handling 16 flights per hour which is the equivalent of approximately 2,200 passengers. President Valcarcel added, “Hopefully within a very short time the airport will be operating close to 24,000 flights per year and handling more than 3 million passengers.